[UPDATE 8/26]: The Navy has finally corrected the record. 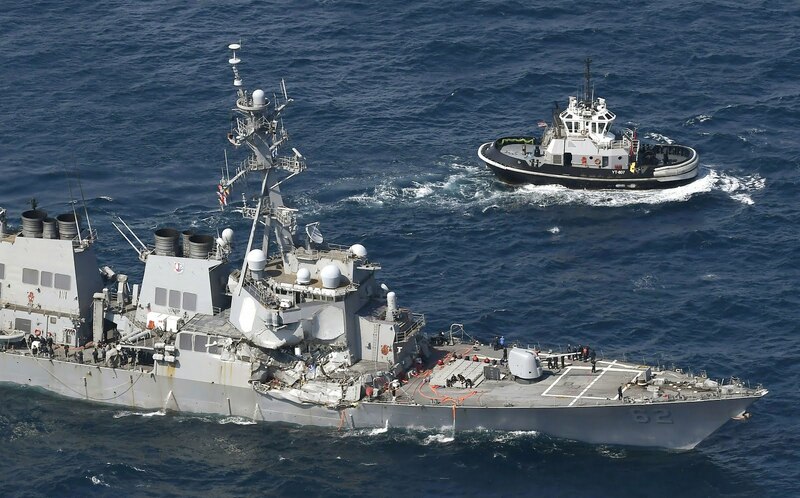 But in fact the collision almost certainly took place an hour earlier, at 1:30AM, and as far as I can tell the Navy has not corrected the record. In fact, on the 19th they doubled-down and insisted that the collision happened at 2:30. How do we know that the collision happened at 1:30? Because thanks to modern tracking technology we know exactly where the ACX Crystal was and when. We don't know where the Fitzgerald was because military ships are not tracked in the same way that cargo ships are (for obvious reasons). 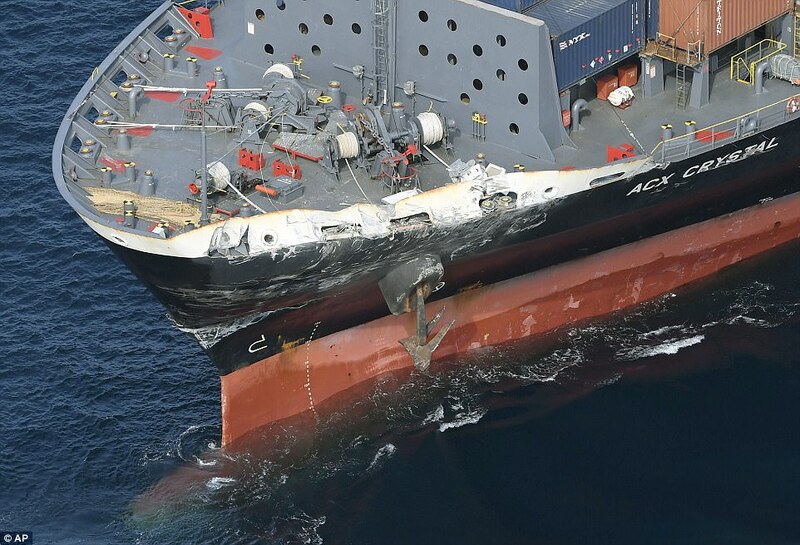 But we can tell from the track of the ACX Crystal and the photos of the damage exactly what happened. The Crystal was en route from Nagoya to Tokyo. Shortly before the crash she made a slight turn to port in order to navigate the straight between Toshima and Oshima islands. Then at 1:30 she made a very sharp turn to the right. This was (almost certainly) a result of the collision. How do we know? Because the Crystal was traveling at 17 knots at the time, and she could not possibly have made a turn that sharp on her own while traveling that fast. The Crystal's port bow hit the Fitzgerald's starboard side abeam her bridge. This would account for the sudden change in course: the Fitzgerald pushed the Crystal to starboard. 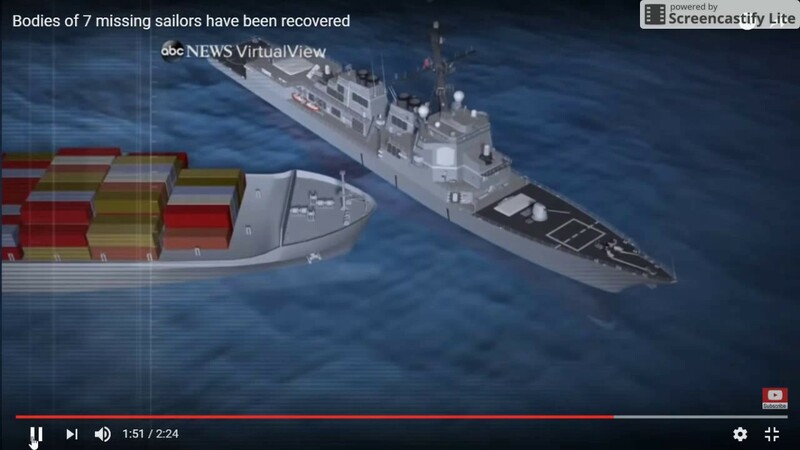 A U.S. warship struck by a container vessel in Japanese waters failed to respond to warning signals or take evasive action before a collision that killed seven of its crew, according to a report of the incident by the Philippine cargo ship's captain. 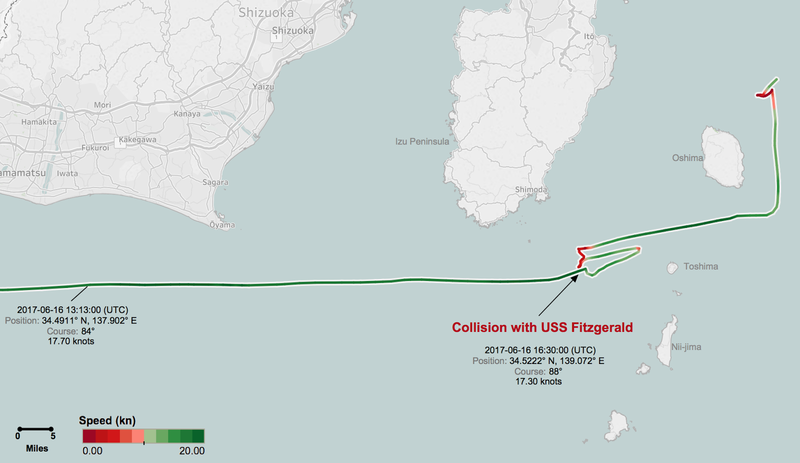 "The container ship steered hard to starboard (right) to avoid the warship, but hit the Fitzgerald 10 minutes later at 1:30 a.m., according to a copy of Captain Ronald Advincula's report to Japanese ship owner Dainichi Investment Corporation that was seen by Reuters." But this does not square with the facts. 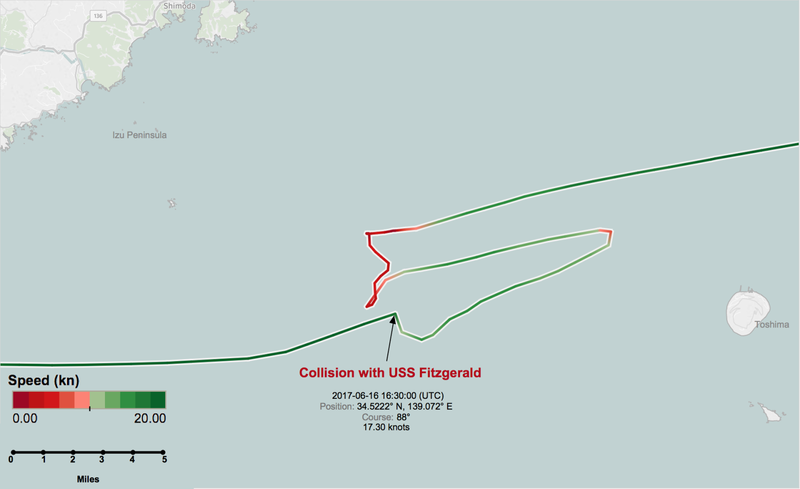 The Crystal did not change course before the collision; if she had the collision surely would have been avoided. The Crystal does not turn on a dime, but ten minutes is more than enough to change course far enough to avoid a collision. Furthermore, if the crew knew of the impending collision, then they surely knew of the actual collision, in which case why would they wait half an hour before turning around or even slowing down? The only theory consistent with the Crystal's trajectory is that there was no one on the Crystal's bridge at the time. The crew was asleep. They were awakened by the collision. The Crystal is enormous, and there are only twenty people on the crew. It is easy to see how, in the darkness, it could have taken them half an hour to figure out what the hell had just happened and decide what to do about it. It is also easy to see why the Crystal's crew would lie about this. What is not so easy to see is why the Navy continues to insist that the collision happened at 2:30 when all of the available facts and everyone else, including the Crystal's crew and the Japanese coast guard say that it happened an hour earlier. Getting it wrong initially could be a mistake, but failing to correct the record over a week later makes it look like a deliberate lie. But why would the Navy lie about this? It makes no sense. For what it's worth, I think the Navy's response is more likely to be inept public affairs management than deliberate lying. It looks to me like they simply don't want to change anything they're saying publicly until the internal investigation is complete.